The ill-fated journey of the Nostromo in Ridley Scott's "Alien" is the kind of epic space excursion that avid 1970s science fiction pioneers like Steven Spielberg and George Lucas would probably discard in early script stages. On a written page, described in broad strokes, the concept lacks the potential visual dynamics of a "Star Wars" and the innovative scope of a "2001: A Space Odyssey." As a finished screenplay, it would be hard to assume the result being anything other than a carbon copy of those low-budget 1950s space exploitation sci-fi horror films that only film-crazed teens would have paid money to see. The revolution of visual effects in the late 60s and early 70s, furthermore, meant that the concept of silly B-movie space travel was no longer something that audiences would fall for. Just as Stanley Kubrick hotwired a new reality for filmmakers with "2001," the genre dominated by fearsome aliens picking off Earth's inhabitants had lost its footing. Movie studios knew this just as well as the average filmgoer did, and when Dan O'Bannon's early drafts of the "Alien" script made the rounds with various high-profile Hollywood distributors, few of his calls were returned. Who could blame them? This was, after all, the same guy whose first mark of fame was John Carpenter's 1974 student film "Dark Star," an extremely low-budget science fiction comedy that, despite acquiring a cult following, was initially seen by many as just another primitive example of a long-deceased sub-genre (O'Bannon's admission: "Instead of the most impressive student film ever made, we had the most unimpressive professional film ever made.") A reputable writer is supposed to consider himself lucky if his script is picked up at all; O'Bannon might have saw it as a blessing that his early treatments weren't dropped into the garbage bin before anyone even got beyond the title page. What he probably had not counted on, though, was Twentieth Century Fox being stimulated by the immense success of a movie called "Star Wars." After Lucas' epic hit commercial gold, the studio began anxiously scouring the industry for any science fiction screenplays they could find, and at the ideal moment, a revised version of "Alien" wound up on their desks. Producer Walter Hill also shared in the early enthusiasm expressed by Fox; he was the first choice to be director (although according to O'Bannon in a featurette released with the Director's cut DVD, Hill was too insistent on taking complete credit for rewriting the screenplay for there to be any hope of positive synergy between the two). Bad news for Hill, good news for us; comparing his history in the cinema to that of his successor Ridley Scott is like leveling an expert and an understudy. The history of the inception of "Alien" is as complex and convoluted as movie back-stories have been, but to completely devote any kind of essay on the film itself to its pre-production drama would also detract readers from embracing what is on the screen itself: a movie so good, so involving and so jolting that it not only takes is place among the great science fiction films of our time, but also the great thrillers. Hitchcock would no doubt have felt the hair on his neck stand had he lived long enough to witness the dread that both Scott and O'Bannon manage to pack in two hours of celluloid. This is one of those movies that is strategic in its pacing and skillful in its delivery of tension, and the fact that it never tries to cheat the audience on explanations or human involvement gives it a resonating quality that was absent even in the great genre flicks of its time. The story, now regarded mostly as a platform for an evolving movie franchise as well as countless comic book and video game spin-offs, recalls the timeless setup of "The Thing" by Howard Hawks in the way it isolates its characters before terrorizing them with both the unknown and the unpredictable. The movie opens in dead silence, as the Nostromo, a vessel carrying tons of ore back to Earth, glides into the camera's view plane. Inside, seven lone crew men (and women) are being stirred from their hyper-sleep by the computer mainframe (wisely referred to as "Mother"). Expecting that their slumber was interrupted because of the ship being in close proximity with its target destination, the crew is shocked to learn that they were instead awakened to answer a strange distress signal emulated from a nearby planet. Conveniently, the movie has one of its characters point out that such calls, according to company by-laws, always have to be investigated by active crew members, and that refusal to do so can result in a complete revoking of their company shares. Go figure. The ship docks on the surface of the target planetoid; three of the Nostromo crew -- Captain Dallas (Tom Skerritt), Lambert (Veronica Cartwright) and Kane (John Hurt) -- go out to investigate the signal. In the distance, a foreboding foreign spacecraft sits isolated, its view obstructed slightly by jagged terrain and mist, but not enough to diminish the notion that its size is fairly substantial. What is inside? How did it get there? Needless to say for any film that asks these questions, curiosity provokes the investigators, and the three scale the territory to take a gander inside the seemingly-vacant ship. Only the ship isn't a vacant one in any sense of the word; aside from housing the petrified remains of some kind of massive life form (the camera highlights the notion that its decomposition is too great to tell if it was human), a massive nest underneath the main level features a cluster of alien eggs that are leathery in outward appearance. That becomes ill-fated news for Kane, alas, whose own curiosity takes him down into the nests just as the mysterious contents inside one particular egg are beginning to awake. H.R. Giger, the artist at the helm of the alien and its spacecraft, was and is a pioneer in the field of dark art, utilizing brazen concepts of sexuality and menace to evoke his distinctive images. A quick glance through his portfolio instantly justifies why both Scott and O'Bannon saw him as the ideal candidate for this undertaking; his style brings a sense of visual alarm to the table that gives the source material a raw and unmatched edge (ask yourself this: would the movie have been just as scary, no matter how good the writing, had the alien itself been a walking skinny object with big eyes?). Furthermore, the sheer scope of these artistic endeavors create the impression that the alien life forms and their environment extend beyond the reaches of the screen; they are seemingly limitless and unrestricted, and therefore add to the audience's paranoia as the terrifying truths begin to slowly reveal themselves to the characters. The alien itself, born only after Kane is penetrated by a face-hugging parasite that deposits the seed of the creature in his chest, is the kind of screen menace that rivals even the great horror film antagonists of cinema; tall, cylindrical and covered head-to-toe in a slime-like substance, no one ever knows when it will act, and it forces its potential victims to tiptoe around in the tight ship corridors waiting for the moment when it will emerge from the shadows. Adding salt to the wound, the alien's evolved appearance gives it perfect camouflage against the various pipes and wires that edge the ship's interiors, and unless one is carefully eyeing every surface, the probability of someone walking directly into it without knowing so until it's too late is quite high. Ridley Scott's direction is not comparable to any other science fiction space opera of its time; whereas most directors like George Lucas embrace the fantastical shell of their genres, Scott descends into this material as if it were a straight thriller. The argument that the film's build-up is much greater than the payoff only means its range of horror has a greater effect on the psychological scale. Consider, for instance, a scene when Dallas (Skerritt) ventures into the Nostromo's air vents, and is monitored closely by his fellow crew members via a visual indicator panel. At the news of the alien life form headed directly in his direction, Dallas descends one level and into the other, only to find that the alien is waiting for him just beyond the darkness at the bottom. Quick: is the terror greater at the moment the alien reveals itself, or at the mere notion that it is moving so swiftly towards its victim in those prior few seconds? The lone survivor of the Nostromo, of course, is Lieutenant Ripley (Sigourney Weaver), who would go on to engage in battle with the alien life forms in not one, not two, but three sequels (and as this review is being written, rumblings concerning a possible fifth entry into this franchise seem genuine). Even Weaver herself admits the preservation of her character at the end of this film seemed accidental -- after all, how many movies in that era gave the successful surviving instinct to a female? Reportedly, the early scripts by O'Bannon and Ronal Shusett were set up so that the seven major characters were "unisex," meaning that either a man or a woman could fill each of the roles successfully. Was it indeed an accident that Ripley made it off the space ship while her fellow comrades (namely the men) didn't? I'd like to think not. 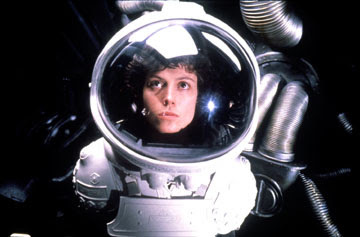 As the movie progresses, even without knowledge of the future events to happen, Ripley is the one character that emerges with any sense of hindsight. Her instincts tell her to shield her fellow crew from possible infection when Kane is brought back to the ship with a face-hugger attached to his head. She knows the potential outcome of an alien life-form wreaking havoc on a human-based space vessel before anyone else does. And when the emerged creature begins picking off fellow crew members, she is the one who has a formulated plan of action against the beast. This is one of those characters that exudes internal strength not because she has to, but just because that's just her basic nature. There are, of course, other factors working against the crew of this ship (such as an android named Ash, who doesn't want the alien killed because he admires its uninhibited nature), but most of them are basically plot devices designed to build back story and explain certain side details (though they are not essential, they also don't detract from the setup, either). Ultimately, the movie's primary function lies in the thrust of the thrills: the rising notion of serious conflict, the intensity of the visuals, the importance of shock value and the jolt of the film's several climaxes. This is a movie about horror in its purest and unrestricted form, as ordinary and likable human beings make no conscious effort to unleash great terror but pay a great price for having a little curiosity.